Join us from August 27h through August 31st for a fun joint blog hop between Whimsy Stamps and Glue Dots. Our teams will be sharing lots of beautiful projects featuring products from both of these companies. And we will have lots of prizes hidden along the hop as well as a grand prize valued at $100! To enter into the giveaways, you just need to comment on EACH blog throughout the hop. Then for the grand prize after you have commented on all stops along the hop, enter your name and email in the linky tool at the last stop. Winners will be randomly selected and announced on Monday, September 3rd. Good luck and have fun! 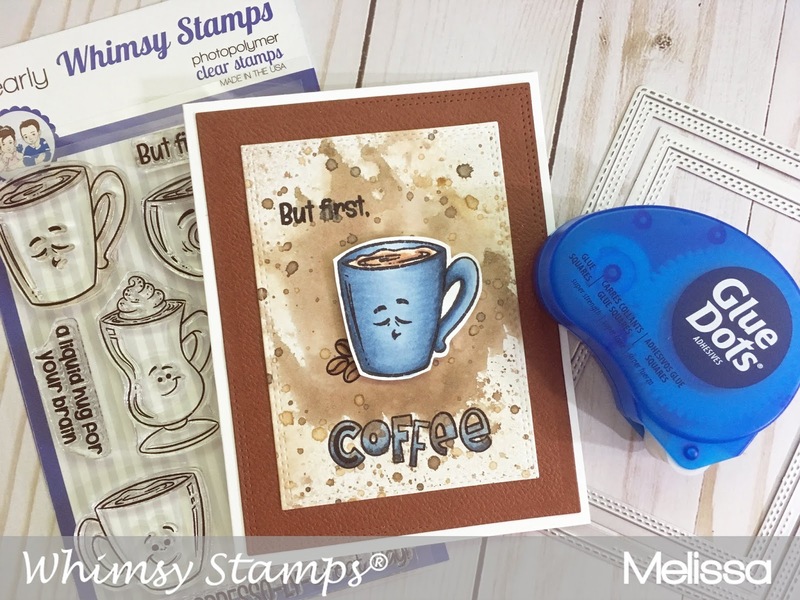 Today, I used the adorable Whimsy Stamps set called Espresso-LY Great. The tired coffee cup is perfect for a coffee drinker like me! I need it to function and as the cup is full, I'm not yet functioning :). 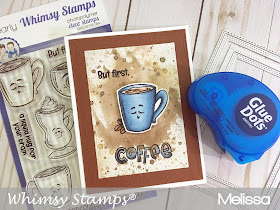 I paired this adorable coffee set with the fantastic Card Builder Die set from Whimsy Stamps. I used Rich Cocoa and Dessert Sand Fireworks Sprays to create the background. I also used the wonderful Glue Dots adhesive roller you see above! All I can say, is it's fantastic! For a full tutorial please watch the video below! Melissa - YOU ARE HERE! He he, this card made me smile. :D Nicely done! Great color combo for a caffeinated card!! Great card, love the splash of colour in the background, and lovely image. Lovely card for the coffee drinker in your life - this came together beautifully, Melissa. Looks like you spilled coffee on your card! Very cute! The background really makes this card! So cute! Love how the coffee cup stick out from the background! Really a great contrast! Cute card right up my alley!! I love coffee! This is my fav stamp set from Whimsy! What a cute creation! Super cute card! Loved the video, too. Cute card. Background is great! This is amazing and one of my favorites. The "spilled coffee" looks so real! My coffee cards are not this good! Nice job!! My coffee cards are never this cute!! Nice card! What a fun coffee card! Love the stamp set you used and the color combo! LOVE this card! I can so relate to the cute little tired looking cup...I need my coffee in the morning! What a creative idea to splash on that fireworks spray, like how it turned out! You rocked this girl! that background!!! Love this card! Oh my! What adorable card!!! Too cute!!! How can you go wrong with a coffee card? I love, love, love it!! 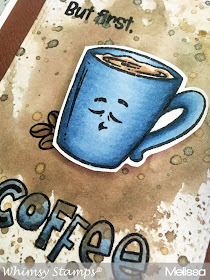 Love this card, as I sit here going through the blog hop with my coffee! Great work! This is a perfect card for a coffee lover or co-worker! this is just darling !! The little cup is so sweet. What a fun card! Love that background! The background is perfect for that adorable image! Beautifully done! What a cute card! Beautifully done! A perfect card for a coffee lover and I love the expression on that little mug. 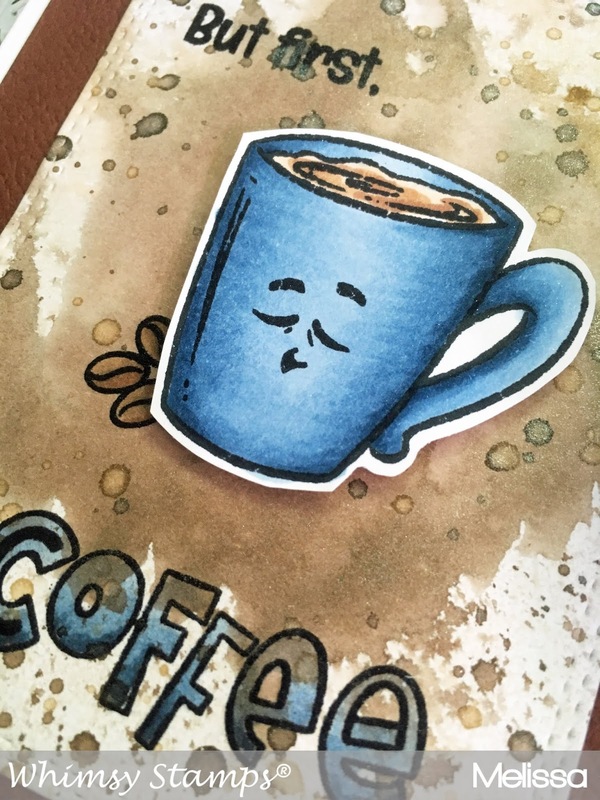 cute coffee themed card. I like the blue and brown together. Sweet combo of colours. Thanks for the inspiration and the technique video. Such a precious coffee card! That facial expression on the mug says it all! HaHa! We all need our morning coffee! Fantastic card! The tutorial was super helpful! I loved watching this while gazing lovingly at my coffee. This is so darling! I may need this set. I learned so much from your video, too! Thank you!! I love that little tired coffee cup <3 Wonderful card!